It has been very handy the past few weeks tileing a back splash and now building a dresser. Yes, @JohnAFD! We love this project - great job! Has it come in handy? Thank you it was a fun project. We’re excited to have this in our kitchen and looking forward to many memories to be made around it. I could not have done it without Shanty2Chic and my Ryobi tools!!!! Wow! You did an amazing job on this table. 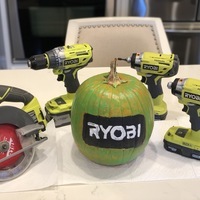 Ashley, Whitney and all of us at RYOBI power tools are so happy you were inspired to build your own table. We especially love those trimmed up legs on this design. Can't wait to see what you build next!